It’s a vital input to ensure a healthy ruminant diet. Even where manure and slurry are returned to the land, extra applications are often needed. In the UK, only around 10% of grassland currently receives sulphate fertilizer. But a shortage will reduce grass yield and efficient nitrogen utilization, increase nitrate loss and reduce sugar content and digestibility*. Grass grown for silage is particularly liable to sulphur deficiency. 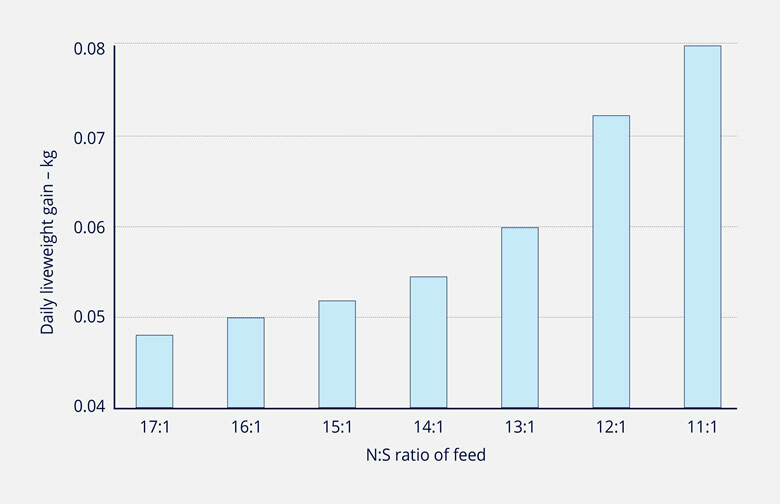 As with arable crops, grass also requires a balance between nitrogen and sulphur for its protein content, and a lack of sulphur will lead to reduced yields and to increased levels of non-protein nitrogen in the feed (see chart). Research on silage carried out by IGER at North Wyke (now part of Rothamsted Research, UK) found dry matter yields increased by 35% over three cuts on sandy loam soil where sulphate was applied**. Nitrate losses were cut by up to 82%, while the true protein and soluble sugars content of the silage were boosted by 25% and 30% respectively. 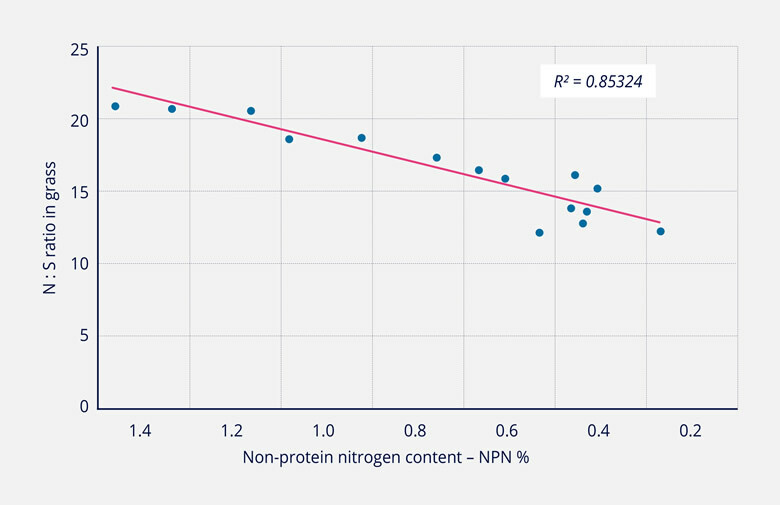 Perhaps even more importantly, the microbes in the rumen also need the correct balance of nitrogen and sulphur. If the grass is short of sulphur they will not be able to use all of its potential feed value. 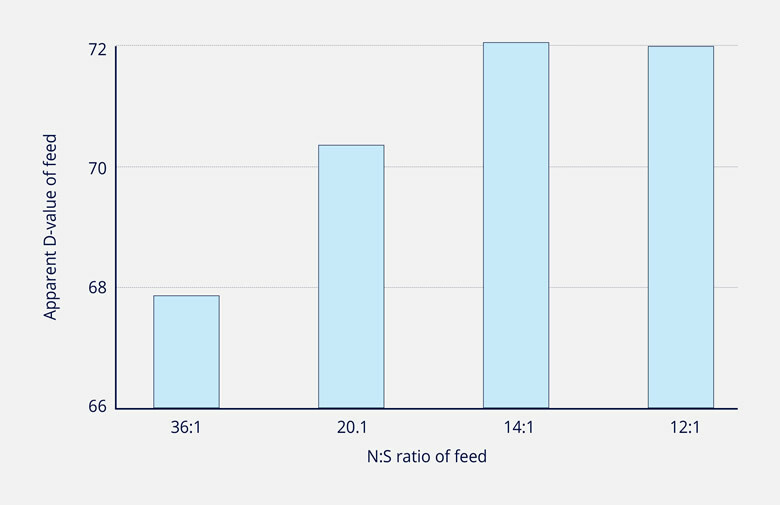 This means that the actual digestibility (D-value) of the feed is reduced and part of the feed value is wasted (see charts). Farmyard manure and slurry contain significant quantities of sulphur. When fresh much of this becomes available to the plant. But in storage the activity of anaerobic bacteria can reduce the sulphate to sulphide and combine it into organic complexes. These cannot be utilized by plants, but gradually oxidize back to sulphate over time. There is little reliable data on the actual availability of sulphur in stored manures, so it is therefore best to consider it as contributing to overall soil reserves, rather than supplying sufficient nutrient for the current crop.